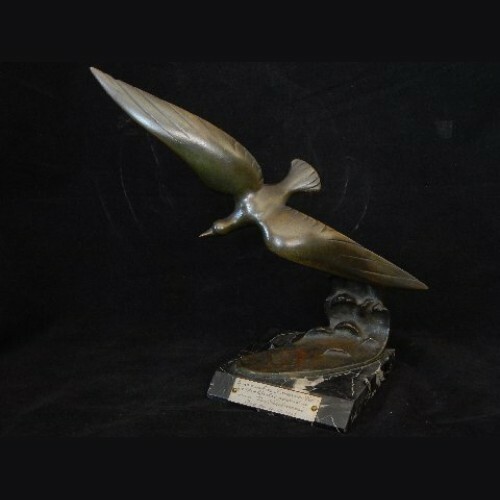 Original elegant bronze sculpture of a seagull in flight over water, a presentation to a Kompanie-Chef by members of a Kraftfahrkompanie (vehicle support company) in occupied Paris, likely Luftwaffe, judging from the bird in flight. It is dated Christmas Eve 1943. The bronze is signed S Melani and stamped bronze. Salvatore Melani, was an Italian sculptor who worked in Paris producing many decorative Art Deco models in the 1920's and early '30's. This bronze measures 11" tall and the wingspan of the gull is 13 1/2". The plated brass plaque is attached with two screws and is hand engraved in script. The variegated marble base measures approx. 4 3/4" x 4 3/4" and has a beveled front edge where the plaque is attached. The bronze has a rich chocolate brown patina and is in excellent condition. Unusual to find an true bronze casting dating from the war years. Mostly white metal and plaster casts at that time.